​but first be sure to read through the example below. You get to the vet’s office and the reception room is packed. The only seat left is the one by the door, where people and dogs are coming and going. In walks a German Shepherd who approaches your Doberman, Sally. After the German Shepherd sniffs her for a few seconds, Sally starts to growl. ​Step 1 - What is the dog doing? (Name the exact behavior the dog is doing, being careful to stay away from adjectives and descriptors. You're looking for a specific behavior.) Answer: Growling. 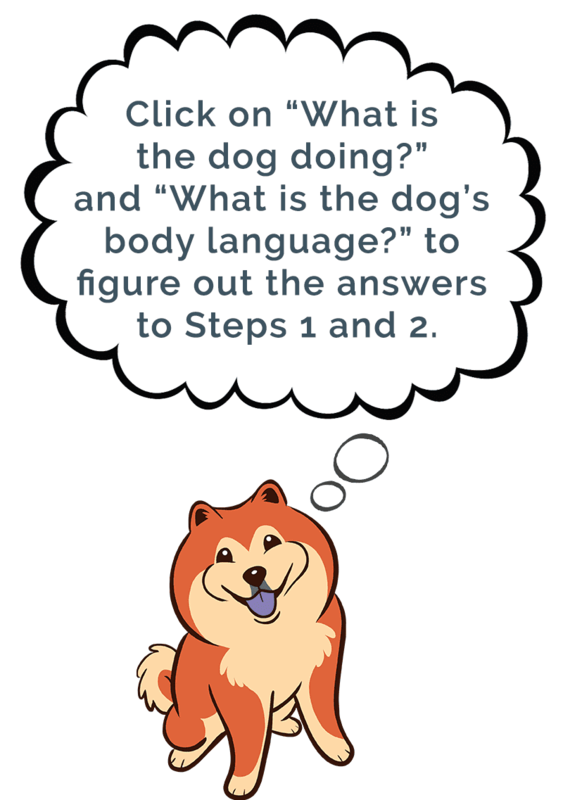 Step 2 - What is the dog's body language? (Observe the dog and list exactly what you see and hear.) Sally licks her lips and yawns. Her ears are back, she’s pulling away from people and dogs who come near, and her tail is tucked. Then when the German Shepherd comes in for a sniff, Sally tenses up more, her weight shifts towards him, she bares her teeth, her ears raise, and she growls. Step 3 - What is going on? (Describe the context of the situation.) Packed reception area at the vet. Many dogs coming and going through the door next to your seat. Let's look more closely at body language. ​Then the German Shepherd walks in and gets close to sniff, and Sally growls. ​Comparing her body language to the images in the Body Language Gallery, we can see that Sally definitely appears distressed. Because of that, play is looking far less likely as an explanation here, but let’s add in Step Three to make sure we’re right. Sally is growling to ask the thing that is scaring her — the other dog — to back off. And the body language cues that led up to her growling are classic signs that a dog is distressed: licking lips and yawning, wide fixed eyes with whites showing (often referred to as “whale eye”) and a tucked tail. Her fears increased with each new person who entered the room and Sally needed to protect herself — she needed more space. So when the German Shepherd walked in and got too close, Sally said, “Back off!” with her growl. Great job, Sally! Without that growl, she might skip past politely asking the other dog to give her space and might instead bite him. In fact, her growl is your cue to help get Sally away from the scary thing. Maybe wait outside or in the car for your appointment or ask if you can wait in one of the exam rooms. To learn more about how dogs look and act when they feel threatened, click here. ​Ready to Speak Dog? Click on any of the dog behaviors listed above to (pardon the pun) “dig” in.